Google Ads (known as AdWords until very recently) are a great way to reach a specific group of people who are already looking for products or services that you offer. The possibilities of targeting and setting bids are vast, and Google is still introducing new tools as we speak, especially when it comes to machine learning. Thanks to all that, a well-prepared campaign can bring you results that will be hard to duplicate in other channels. However, a campaign set up without proper knowledge of the tools and targeting methods will allow you to burn your budget faster than it took me to write this introduction. Today I will tell you what mistakes you can make to become a money-wasting champ. But if you love your money and prefer your campaign to be effective, you can skip my “money wasting hints” and read all the remaining stuff. Have fun! #1 Don’t pay attention to different keyword matching options. Keywords are keywords, right? Money wasting hint: How can you successfully waste your precious money here? It’s super simple. Use only broad match keywords when advertising and get lots of irrelevant traffic you shouldn’t be paying for. This is the default matching option. When you add broad match keywords, the ad will be displayed to people who search for any phrase that contains your keywords or – keep that in mind – their synonyms, in any order, including misspellings. You can modify the broad match using “+” sign in front of one of the keywords in your phrase to prevent it from being replaced by its synonyms. All other rules of the broad matching will still apply. This narrows down targeting to only those searches that contain the phrase in the same order, and without any word in between. The ads will still show to searches that include additional words in front or the end of the phrase, and if the phrase searched is a close variant (misspellings, singular vs plural forms, acronyms, abbreviations of the keywords etc.). This is the most precise match. When you place your keyword inside square brackets, your ad will bid only when someone searches for exactly your keyword (and its close variants) but with nothing before, after or in between. Note: word order doesn’t matter. #2 Don’t exclude anything with negative keywords! Come on, you can afford to pay for useless, irrelevant traffic. Money wasting hint: Running Google Ads for Real Estate for rent? Forget about excluding keywords that imply sales rather than rental, and voila! You have a lot of people looking for homes to buy that will click your ad, get angry, and leave, gorgeously lowering your ad’s quality score and making you pay for nothing. Another brilliant way to burn some money is to forget about negative keywords. What are negative keywords and how a good marketer can make use of them? Negative keywords are basically the words or phrases you don’t want to show your ad for. These are mostly the keywords that might indicate that the person using them is not exactly the right fit for you. I obviously wasn’t looking for a car to buy, but for a repair service in one case and for some used parts in another. Both advertisers wasted money on both of my irrelevant searchers if I clicked on these two. This is the right place to add an entire list of curse words or otherwise unflattering words. This way you prevent your ads for “restaurant in Boston” to be shown when someone is looking for “worst restaurant in Boston” or “crappiest restaurant in Boston” or even “restaurants in Boston to avoid”. Let’s say you run a social media agency and advertise in Google both social media management service, which is the core of your business, and your free webinars, which are an important aspect of your inbound marketing strategy. It will be a smart move to exclude the keywords like “how to” or “seminar” from the ad group where you advertise your social media management services. However, in the ad group you use to advertise your free webinars, you obviously don’t want to exclude these keywords, as they are exactly what you want to bid for. Now an actual, time-saving tip: You don’t have to come up with those lists yourself. You can find lots of readymade lists of curse words or words that don’t apply to any specific niche. Just google “negative keywords starter lists” and you should be able to find something useful. #3 Create just one ad and place your entire budget on it. You will never think of a better ad than the first one, anyway! Why would you create more ads, if the one you spent the entire afternoon on is the best you’ve ever invented and has the most incredible copy humanity has ever witnessed? Well, I don’t know how to tell you this, Don Draper, but Google Ads are all about performance. And performance is all about testing. And if you want to test a solution, you need a reference point, that is why you test against another solution. Running several ads at once will let the system favour the ones that are picked the most often. But testing ads so the system can pick the best one is not the only reason. If that was the case, the system would only pick the best converting ad and stop the remaining ones completely. However, every person is different, and the ad my grandpa may respond to may not really work on myself. There is this saying often attributed to Einstein that perfectly applies to the power of ad rotation: “insanity is doing the same thing over and over and expecting a different result”. When someone searches the same keyword a couple of times, and each time sees a different ad, there is a much bigger chance that they will finally see something that will catch their attention. Money wasting hint: Treat your ads like a sloppy college student treats his socks: throw them into one drawer without arranging them accordingly. As a result, just like the student running late for an exam might end up putting on socks that are not matching or have giant toe holes (the horror!) you will end up with one big mess where no keyword fits the ad text, and the ads have nothing to do with the final URLs. #5 Forget about keywords in your ad copy. They will click it anyway! Money wasting hint: Don’t put the keyword in the copy, believing that if someone googled something, they don’t need to see the same term in the text. Have no clue that most users are scanning the positions in Google rather than reading them in full, until their eyes stop at the ad with the search term in the heading or bolded in the description. Surprisingly, it’s not your ad. Like I said, the closer the copy in your ad matches what the user actually typed to see your ad, the bigger the chance that the user will actually click the ad and not get lost in the process. Just like your display campaigns and your website design have to constantly remind the visitor what they are supposed to do next, it is exactly the same for your Google Ads. Your ad has to be a natural next step in the path your Customer has started with typing the keyword. 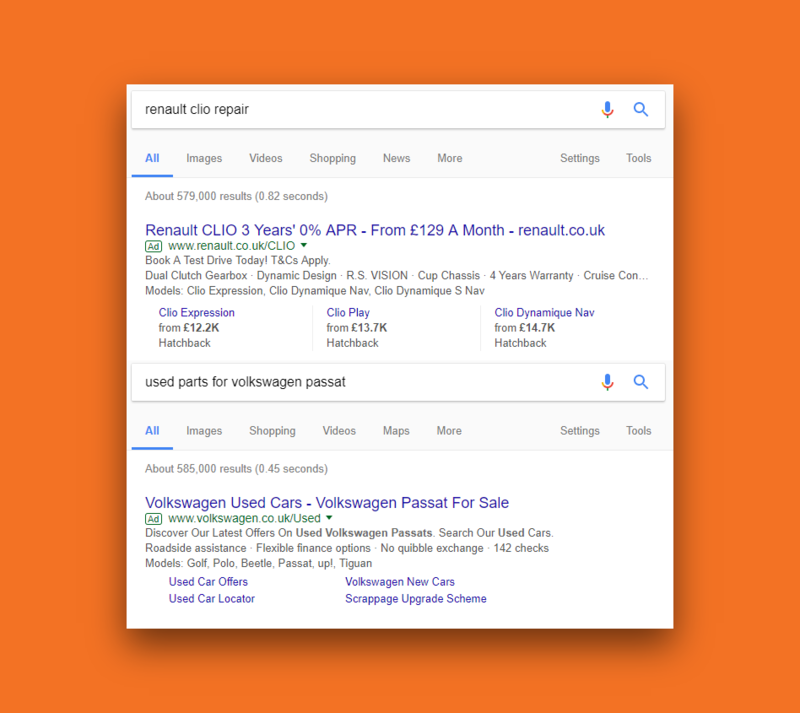 The moment the person looks at your ad and can’t find the keywords while quickly scanning the text, the bigger the chance that their eyes will skip your ad in favor of the ad with keywords, right next to yours! #6 Don’t use ad extensions. Keep it simple! Money wasting hint: Forget about ad extensions and let all the ads be modest in appearance and an easy to overlook combination of headline, link and description. The ad will take very little space compared to other ads on the page, and other than your copy, there will be nothing else to encourage the user to interact. Let’s face it: even the most brilliant ad copy won’t make your ad stand out if it’s one of five or six ads shown on top of each other. If you can add additional lines of texts with relevant info such as clickable phone number, important site links or call-outs, then why wouldn’t you do it? Not only will it give you additional real estate to let you stand out from the crowd, but it will also let the user see much more actionable information. It doesn’t cost you anything more than a bit of your work to prepare it, and the results can be pretty great. At the time of writing, there are 10 types of extensions you can choose from. Let me start with the ones from the example above. 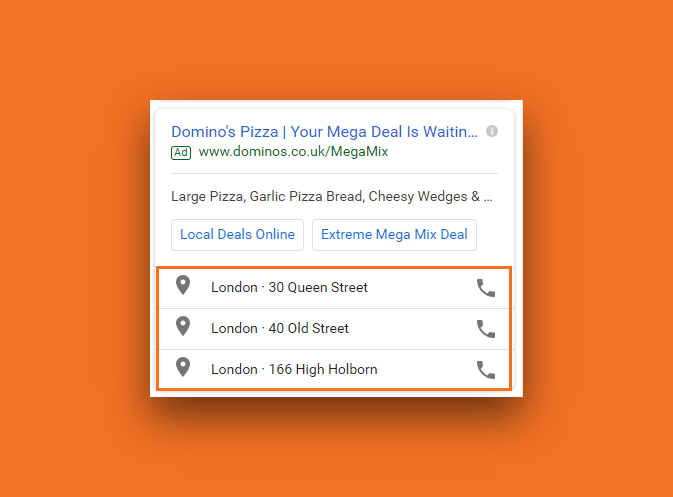 Call extensions – This extension is a great way to encourage user to immediately call you, by letting you put your phone number or a clickable phone icon directly into the ads displayed on mobile devices. Price extensions – Pretty self-explanatory as well. Here you can show some of the services or products in your offer, with prices and short descriptions. Location extensions – This extension is great to get you some foot traffic. The ad will display the location and a call button, together with a link to the company’s info page in Google Maps. Affiliate location extensions – The same as above, but lets you list several locations for a chain or franchise. Here is the example of affiliate location extensions (marked). Also, note the sitelink extension displayed differently, in the form of the carousel – this is how they should look on mobile devices. Message extensions – similar to call extensions, but taking you to your SMS messaging app on your phone (these can include some predefined text). 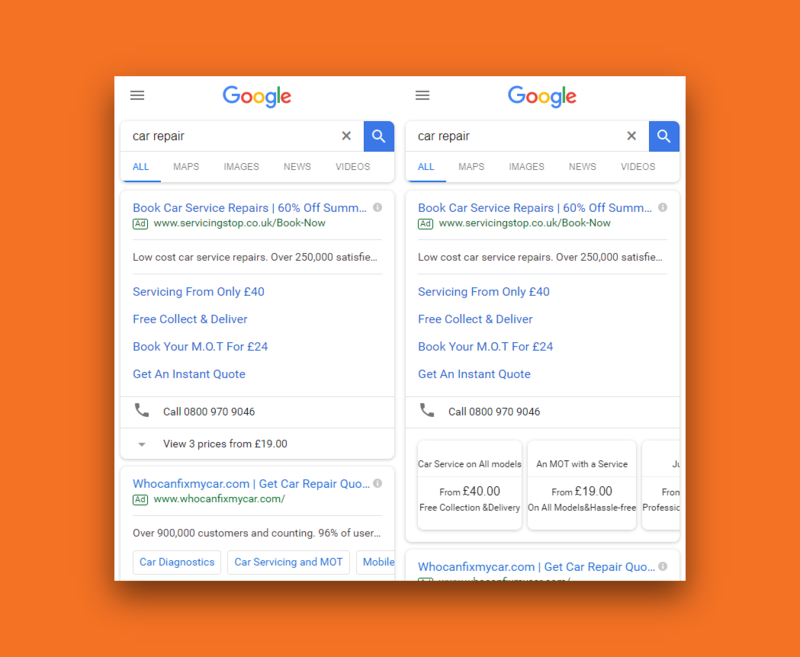 Structured snippet extensions – Showcase information potential customers will find most valuable by selecting a predefined header (like product or service category) and listing items. 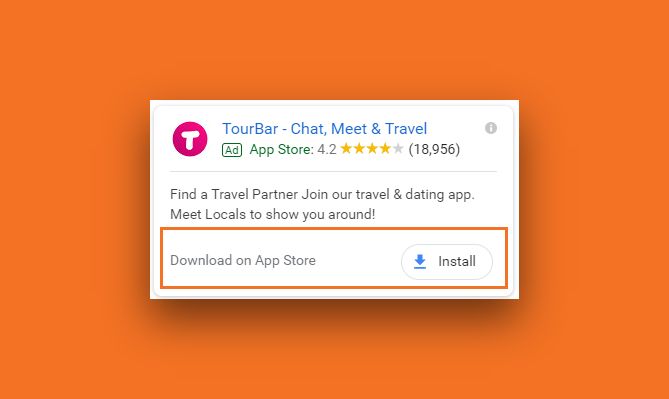 App extensions – extension for encouraging app download, with the CTA button taking you to the Google Play or Apple’s App Store. #7 Don’t bid on your own brand, It’s already on the top! Money wasting hint: Why would you pay for something twice, right? Have unshakable faith in the mighty power of organic results, forgetting that your competitors will do whatever it takes to bid on your brand and appear with their own ad right above you, likely stealing your loyal customers, possibly forever. Well, your brand won’t be on top anymore, if someone decides to use your brand name as a keyword in their own campaign. And the last thing you want to achieve is to lose the most valuable customers, i.e. the ones that are looking for your brand precisely! You simply cannot make that happen, that is why bidding on your own brand is a must! Bidding on branded keyword has another advantage: It will make your entire account slightly more cost-effective. How? These ads will have by far the best CTRs from all of your ads. Good CTR will cause your ad’s Quality Score to go up, and this, in turn, will drive up your account’s. Not convinced yet? Then consider this: even if there are no competitors bidding on your brand, with both paid (at a very low cost per click) and organic results, you can end up taking almost entire screen (especially on mobile). Do you think someone will keep searching when the entire screen is yours? Me neither. Money wasting hint: Consider the top spot as the most important, as a matter of principle. A matter of honor! Top spot is what would make your ancestors proud! As a result, you will bid aggressively and win all auctions, until you run out of money, which happens rather sooner than later. In all seriousness, every marketer should know the purpose of the Google Ads campaign from the start. 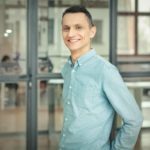 And that purpose is in general conversion, and in case of Google Ads, technically you want as many relevant clicks as possible with as little a cost per click as possible. What happens when your most important KPI is the percentage of top spots? You will win all the auctions until you run out of money. Then you don’t show your ad to anybody at all. Imagine you have 300 USD to spend per day, and let’s assume you can either win every auction with a bid of 3 dollars a click, or you can always show up in the top three for 1 dollar. Would you rather get 100 clicks with a huge click-through rate, and then stop showing your ad at all after the budget is gone? Or would you want to keep showing in the top three, get slightly worse clickthrough rate (which can be improved if your ad is great, you are smart in your use of extensions etc. ), but get 300 clicks after all, and some additional exposure (as the ad is definitely shown to more people). Top spot doesn’t necessarily have to be the best driver of quality traffic either. On the contrary, if you want to attract users that are interested in your offer, rather than those researching their options, it might be even better for the quality of the traffic to lower the position of your ad by lowering your bids accordingly. Why? You might assume that if someone spent some time to read all three or four ads that are on the top, or even scrolled down to see what’s at the bottom, and still decided to click your ad, they might be a much more valuable visitor than someone who clicked whatever showed up first. The first position is likely to attract significantly more accidental clicks than the lower ones, so you have to keep that in mind too. Money wasting hint: Think of your customers as priceless, and try to attract them at all cost. This might sound obvious, but you would be surprised how many marketers forget, that at the core of doing any business lies its profitability. There is no profit possible, however, if the cost of reaching your customer is higher than the lifetime value (LTV) your customer provides. However, it is worth to emphasize the word lifetime. A customer is worth much more than their first conversion. Sure, if you sell wedding dresses, and spend $3000 on acquiring a customer, who buys a $1000 wedding dress, then leaves and never returns (because, hopefully, they won’t need more wedding dresses from you), then you most likely wasted a small fortune. This is a clear indicator that the campaign improved brand awareness, and people will continue to visit the store even without a single penny spent on promotion. 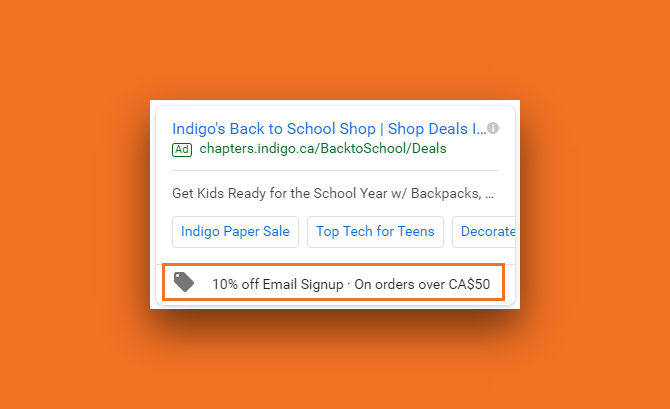 Add some retargeting to the marketing cake, and you see how that one click you bought might be worth much more than the one visit you immediately got. #10 Set it and forget it. Things are going to work out themselves, right? #3 Get back to the account a month later and see terrible CPCs, traffic quality, search volume etc. #5 Shut down all the campaigns and start printing leaflets. I would say monitoring and adjusting your campaign might be even more important than the initial setup. It is when you take a close look at the campaign results during the initial weeks that you can see how your initial predictions work out in reality. And, granted, there will be a lot of room for improvement. For example, irrelevant searches that lead to huge bounce rate for your ads are one of the things that are especially hard to predict before you actually see the search terms people type to get to you. Once you start seeing actual data and once high abandonment for specific searches is evident, you will be able to exclude some terms with the use of negative keywords. Another example is bid adjustment, which is only really possible once the campaigns are running and you see what positions your ads get, what are the clickthrough rates and how much it all costs you. I could probably write a separate, lengthy article on this part alone, as these two issues are really just the tip of the iceberg. For now, just keep in mind that thorough, continuous monitoring and adjustments are absolutely crucial for a successful campaign. Lots of things can go wrong when setting up your Google Ads account without much of experience and knowledge of the tool, but I hope that this article will shed some light on the most common mistakes and how all marketers can avoid them. Keep in mind that this list is by no means finished, especially that Google keeps implementing more and more new features into their ads ecosystem. And that gives us more and more opportunities to get great results, but also to squander our hard-earned money.